Here are the best Grand Canyon tours from Las Vegas! There are so many things to see and do at all three Rims. At Grand West, you can visit the famous Skywalk bridge, enjoy the views from Guano Point and Eagle Point, go below the rim, take a boat tour or raft the Colorad River and visit the Hualapai Indian village. At the South Rim you can admire the views from Mather Point and Yavapai Point and hike along the Bright Angel Trail. At North Rim (operational during spring-summer-fall) you can ride an ATV and a take guided Polaris Ranger tour. The most popular ways to get to the Grand Canyon from Las Vegas are helicopter rides, airplane tours and jeep tours . All of these tours include transportation from/to hotel. The most incredible way to explore this impressive natural wonder, of course, taking Grand Canyon tours from Las Vegas by helicopter. No wonder that helicopter tours are so popular in Vegas - they are affordable, and the panoramic views of the canyon itself and the horizon are to die for, and if you take photos or video you will be able to relive the experience over and over again. Descending into the canyon by helicopter is included in many other tours - the trip usually lasts no longer than 10 minutes each way. These tours include a flight above the Grand Canyon West, landing, express VIP visit to Skywalk and flight over Las Vegas Strip. If you are pressed for time, but still want to see theGrand Canyon - this air only tour is your best bet. This highly popular "All American" tour will take you to the bottom of the Grand Canyon where you can have a champagne picnic while admiring Colorado River. These Grand Canyon tours from Las Vegas are all about fun activities: boating down Colorado River, lots of fre time to explore, and Hualapai Indian lunch! For a memorable Las Vegas vacation, opt in for the Sunset helicopter tour! Champagne picnic during sunset and amazing views of The Strip in the evening will leave you with unforgettable memories! This tour is all about getting a VIP express access to the Skywalk that you've probably heard so much about! Another awesome helicopter tour from Las Vegas that includes a VIP entry to Skywalk, landing on the bottom and a boat ride down Colorado River. If you love adventure, choose this rafting tour of Colorado River with helicopter flight from Las Vegas and a short picnic at the bottom of the Grand Canyon! Skywalk is one of the most impressive structures in the world - if you don't believe me, look at the photo. You can't beat the 360° aerial view of the canyon even with a helicopter flight! 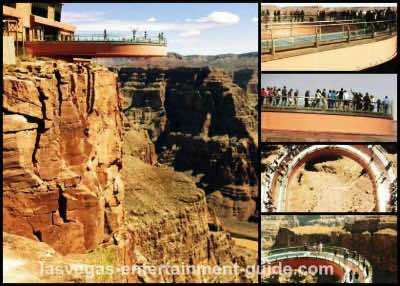 You can find Grand Canyon tours from Las Vegas to the Skywalk for any taste and budget: from the most luxurious tours that include Skywalk, helicopter and landing at the bottom to quick and easy day trip from Las Vegas by coach with Skywalk and Hoover Dam. These popular Grand Canyon tours from Las Vegas by Maverick Airlines make the best use of your time by taking you directly to The Skywalk and back. These tours combine an air flight to Grand Canyon West, descent to the bottom by helicopter, a boat ride and an optional visit to the Skywalk bridge. This is a very fast helicopter tour that will take you directly to the Skywalk, ideal for those pressed for time. This exciting helicopter tour offers an express access to Grand Canyon Skywalk bridge with no delays, so all you do is relax and enjoy! Get the best of Grand Canyon West with this comprehensive bus/SUV tour! Hoover Dam, free time at Hualapai Indian village & Joshua Tree Forest are included, Skywalk is optional. 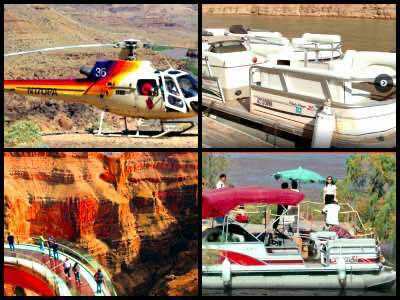 These highly popular Grand Canyon tours from Las Vegas offer the best the city has got to offer: a helicopter flight over the Strip and the Grand Canyon, boat ride, Hualapai Indian village and an optional Skywalk. During these highly popular bus tours you will get close and personal with both the Hoover Dam and Grand Canyon West. Skywalk is optional. This tour includes a scenic flight to Grand Canyon West by airplane, and a ground tour of the West Rim's Eagle Point and Guano Point. Upgradable to include Skywalk and a helicopter for a 6 min descent to the bottom. This is a luxurious trip to the Grand Canyon by famous Pink Jeeps that include a descent to the bottom of the Canyon by helicopter and a boat ride down Colorado river. Skywalk is not included, but you can visit it by yourself. See the best of Grand Canyon West with this airplane tour that also includes a descent to the bottom by helicopter, a pontoon boat ride and an optional visit to the Skywalk. This is a helicopter tour to Grand Canyon West, that makes it possible for you to enjoy it on your own, or to opt in for either a descent to the bottom or for a visit to the Skywalk. This fun-filled Grand Canyon day trip from Las Vegas by coach includes a helicopter flight, a boat ride and an optional visit to the Skywalk. Choose Grand Canyon tours from Las Vegas by airplane for a fast and efficient way to explore this magnificent National Park! Airplanes fly from Las Vegas to the West, South Rim and North Rim of the canyon and can take from a couple of hours to an entire day. 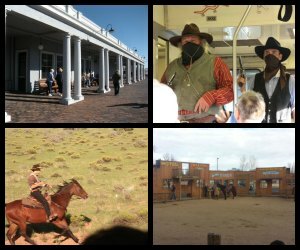 You can combine your airplane flight with a descent on a helicopter to the bottom of the canyon, with a boat ride, a visit to the Skywalk or you could spend an entire day at a real Western ranch! This quick and easy air tour will give you the best views of the Grand Canyon without any extra activities - perfect for those who want to come back to Vegas to catch an evening show! If walking/riding a shuttle bus around the Guano Point and Eagle Point and lunch at the West Rim sound like fun to you, take these Grand Canyon tours from Las Vegas by air! For a complete Grand Canyon experience, you can add a Skywalk to your Indian Country adventure that includes the free time at the Guano Point and Eagle Point. These air tours from Las Vegas will take you to Grand Canyon West, where you can descend to below the rim to spend some time at the bottom, or visit the Skywalk. These adventurous air tours fly to Grand Canyon West, where you an enjoy a pontoon boat ride at the bottom of the Canyon. 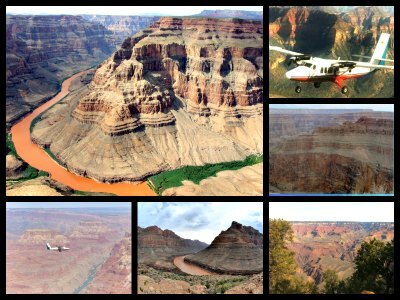 A complete Grand Canyon experience - Add Skywalk to your adventurous air tour of Grand Canyon West with Helicopter and boat. With these scenic Grand Canyon tours from Las Vegas you will be able to see the wilder, less explored part of the Canyon - the South Rim. This is a seasonal air and ground tour of the North Rim of the Grand Canyon with fun activities, offered April through November. Grand Canyon tours from Las Vegas by Pink Jeeps are very popular thanks to their comfort. Once you arrive, you have multiple options such as taking a helicopter ride or a boat ride with Skywalk. Most of the Grand Canyon jeep tours I recommend here take place in luxury Pink Jeeps, which are comfortable air conditioned jeeps/SUV, specifically designed for sightseeing. But if you prefer an extreme off-road experience, you can find an excellent Hummer tour. You can ride to the Grand Canyon by a state-of-the-art SUV/Pink Jeep, visit the Guano Point and the Eagle Point, go below the Rim in a helicopter and take a narrated boat ride on Colorado River. These comfortable Grand Canyon tours from Las Vegas are all about enjoying the views of the Hoover Dam, Joshua Trees, and of course the West Rim! With these unique Grand Canyon South Rim tours you can walk along the Bright Angel Trail, and enjoy incredible views from the Mather Point and Yavapai Point. Hoover Dam and the Grand Canyon are two of the most popular attractions for those visiting Las Vegas, and this informative tour by Pink Jeeps make it possible to visit both! 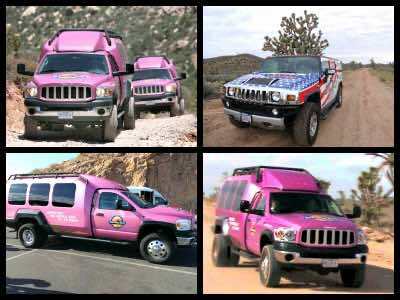 Hummer tours to the Grand Canyon West are fun, comfortable and family-friendly. Upgrade options are available for Helicopter, Boat ride and Skywalk. One of the most exciting ways to explore the Grand Canyon is rafting Colorado River. 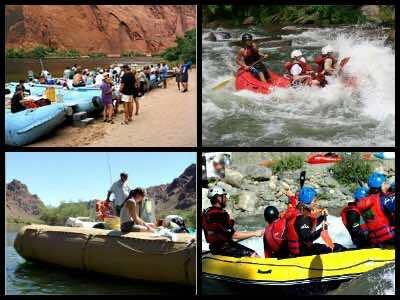 There are many different Grand Canyon tours in oar, paddle or motorized rafts. Tours last anywhere from 1 day to two weeks - for the most adventurous. Most rafting tours operate between April and October, but you can also find tours that work year round. These 11 miles family friendly rafting tours are coupled with an exciting helicopter transfer from Las Vegas. Another exciting helicopter tour with an 11-miles long rafting trip down the Colorado River. Experience the magic scenery with Grand Canyon tours that include an airplane flight and a 15,5 miles rafting adventure. Enjoy the scenic views of the Colorado River and Black Canyon from below on this floating tour from Las Vegas. This is a challenging white water rafting tour of the Colorado River with 3 to class 6 rapids. A short helicopter transfer will enhance your experience. This is a family friendly adventure tour departing from the South Rim of the Grand Canyon. if you want to drive to the Grand Canyon yourself, you can enjoy a challenging 40 miles-long rafting tour on the Colorado River. For daredevils, there are excellent challenging Grand Canyon tours on a raft that last 3 days long! Multi-day tours on a raft are perfect for an adventurous summer vacation. These tours last anywhere from 1 to 9 days! Grand Canyon tours from Las Vegas by bus are a great introduction for beginners. Not to mention that they are usually cheaper than other trips! 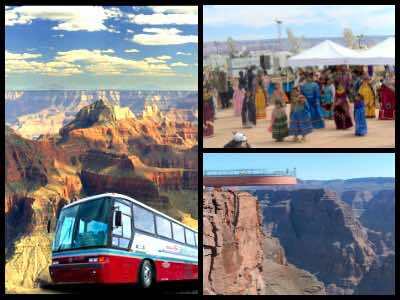 Some of these Grand Canyon bus trips include optional Skywalk, which is a new observation point with the most breathtaking view of the Grand Canyon. Other tours include airplane or helicopter flight, or an optional boat. You can easily customize most tours to include or exclude the optional upgrades. These are the most fun and the most comprehensive bus tours that include the West RIm, Hoover Dam, Joshua Tree Forest and plenty of activities. If you don't mind spending all day on the way and at the Grand Canyon, this cheap comprehensive tour of the West Rim is your best choice. This is one of the most popular tours, as it includes both the Grand Canyon and a photo stop at Hoover Dam. Grand Canyon tours from Las Vegas are fun when combined with a slow descend to the bottom helicopter in a helicopter, and a boat ride on Colorado River. These tours will take you to the wilder, less explored part of the Grand Canyon - it's South Rim. An optional IMAX movie about the canyon is included. With these small-group VIP tours you will visit two of the most popular attractions - Hoover Dam and th South Rim of the Grand Canyon. 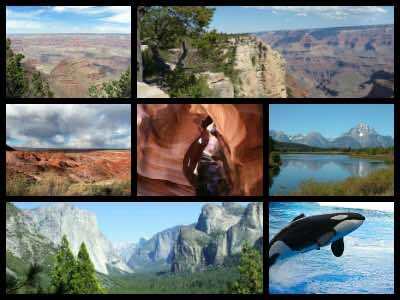 There are many extended multi-day Grand Canyon tours from Las Vegas that also include other parks (Yellowstone, Bryce Canyon, Zion) and cities such as San Francisco, Los Angeles, and other attractions such as Universal Studios or Disneyland. There is no better way to explore the wonders of the world than taking Grand Canyon vacation tour with one of the most trusted tour companies that we carefully researched and are happy to recommend. Train tours are probably the most fun way to get to the Grand Canyon. Most of the trains depart from Williams, Arizona, so you will probably need to drive there by yourself, take a shuttle bus or get one available Grand Canyon tour from Las Vegas by train with transportation. Some Grand Canyon tours by train are conducted in a restored, authentically looking train that reminds you of the 1950s. On the train, you will be entertained by country music and other shows! Only one train tour departs from Las Vegas, with a bus transfer.